Thought I'd share a little DIY Valentine treat with you. This sort of took place over designing Valentine's for my kids classroom parties. I cannot compete with Transformers or Princesses at all! Lucky for the teachers since they were my next target and of course for you as well. My husbands favorite thing about the restaurant Texas Road House is the Cinnamon Honey Butter they serve with bread before hand. I had found a recipe a while back online for it and it's a sure hit at our house. 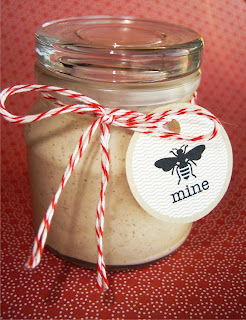 I thought how fun to jar some up and share with family, friends and neighbors for V-day. I designed the tag that is attached to the bakers string and you can print them here. I actually printed mine so the images would be on the back and front but, it is a little tricky at times to have them line up so I recommend printing them out and gluing them together. Printing them on heavy card stock is best. 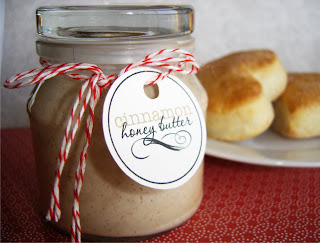 In a medium bowl, combine butter, confectioners' sugar honey and cinnamon. Beat until light and fluffy. After designing the labels I was racking my brain on what else I can do with this as far as packaging them up. The cute little jars the butter is in I had purchased for $1 each at World Market. I hopped over to Michaels craft store and saw these already made little cotton drawstring bags .49 cents each - can't go wrong. Soooo... with those I whipped up a Happy Valentine's label, printed them on T-shirt transfer paper and ironed them onto the bags. Ta-Da! I bagged up a serving up Bisquick in a plastic baggy and placed that inside along with the recipe for biscuits. Then attached a heart shaped cookie cutter to the outside of the cotton bag so of course the biscuits can be cut out as hearts.